Swimmers, boaters, and anglers visiting Indiana’s coastline this summer will again be able to learn about conditions in Southern Lake Michigan thanks to real-time data collected by the Michigan City buoy. The buoy, launched for the first time last fall, returned to its post four miles from shore last week to collect data on wave height and direction, wind speed, and air and surface water temperatures. It will stay in the water until November. The relaunch comes just in time to help make summer trips to Michigan City and the Indiana dunes safer. Throughout the season, scientists at the National Weather Service (NWS) in northern Indiana will use wave height and frequency data collected by the buoy to better anticipate likely locations of strong waves and rip currents that cause dangerous swimming conditions. 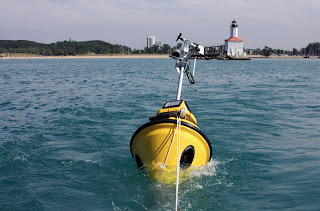 The only one of its kind in the Indiana waters of the lake, the Michigan City buoy gives forecasters access to historically unavailable nearshore data where conditions are much different than at the center of the lake. Real-time data from the buoy has already helped NWS improve their wave height forecasts. As with last year, all of the data collected can be seen on IISG’s website. The site lets visitors see real-time snapshots of lake conditions—updated every 10 minutes—as well as trends over 24-hour and 5-day periods. And this year, the Michigan City buoy joins the ranks of environmental monitors that contribute to NOAA’s National Data Buoy Center. The addition makes it possible for people to easily access data older than five days and track trends over longer periods of time. This archived data is particularly important for researchers and natural resource managers who rely on the buoy’s data to improve weather forecasts, protect water quality, and predict where best to fish. To learn more about how the buoy helps scientists and forecasters better understand how the lake works, visit the website and click on the stories at the bottom of the page. The buoy launch also coincides with Rip Current Awareness Week, and is just one piece of a larger effort to protect people from the dangers of rip currents. Visit the Rip Current Awareness Week website to learn more about rip currents and what you can do to protect yourself this summer.